Took a crew out to The Cajun Chalet near three bayou bay last week and put a smack down on the bull Reds!! It was so nice to relax on the big screened porch while Chef Mike cooked dinner. 3 days 2 nights on da bayou it couldn't get any better!! The big trout are on the beaches and hitting the baits hard. Capt. Theophile is catching some really nice trout on artificial lures and making his clients happy! Most trout are being caught on the bomber silver mullet on a quarter oz bomber chartreuse jig head. A slow swimming action and bumping the lure off the bottom seams to work. The beaches have some grass and pulling the lure through the grass triggers a quick bite! Some clients are having a bit of luck with top water and suspended baits. The Team here at Bourgeois Fishing Charters have a new adventure for our customers. Trophy Bull-Reds on top-water baits!! We will take 2 anglers to large flats and oyster reefs with feeding bull reds that crash top-water baits!! This trip will test your angling skills as a 30-40lb. fish is a tough fight on light spinning or baitâcasting tackle! The redfish has turned on and are being caught on our daily trips. Most of the redfish are taking artificial lures like gold spoon and black and yellow spinner baits, however plenty of action on market shrimp under a cork. Our Captains have located them on shore lines down current from points where bait can not swim against the current, of wind. Captain Theophile took delivery on his new 4 passenger Seaplane. The first trip was Awesome!! He had two anglers form Texas over to catch some Speckled Trout and Redfish. The Top Water bite was not on, as the waters are still cool for spawning, 68-70 degrees, but they slammed the Bomber Silver Mullet!! Captain Theophile used a steady retrieve and would stop the bait and let it sink the pick it up again, thatâs when they would hit it. The Big Trout are moving on the sandbars ready for the spawn, so get your dates in and catch your trophy trout!! The Trout migration has begun in the North Barataria Bay! Capt. Theophile set out on a quick trip with Ginger in the windy blue bird day and located some nice trout a little further South than last week. The school was feeding in a grass flat near a deepwater bayou, most were caught on Boo Yah One Knock dragging the bait out of the grass. Our Team will stay on them as the trout swim to the beaches for the spring spawn. Finding the bite in muddy water. With a front and hard North winds then High powered South winds with a full moon, falling tide, the water is really shook-up and muddy. A charters confidence level quickly goes up with clean water and sight casting to visible fish. Itâs nice to search and find that quiet cove that has clean water and active fish, but with the current conditions there are very few areas much less with active fish ready to bite. Well the next pattern would be current lines coming off the contours of the bays or cuts in the marsh moving water with the currents or winds. Theses current line can collect schools of bait fish and the trout and reds know itâs easy pickins for a quick meal!! Capt. Theophile found a decent trout bite and picked up a few redfish at the same time. The trout were caught on the bomber mud minnow silver flake and chartreuse working the current line. Plenty slot redfish in January!! 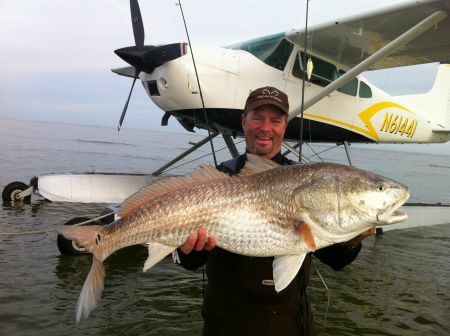 The Team here at Bourgeois Fishing Charters have been catching redfish this winter. Capt. Kevin took out a group earlier in the week and caught a limit of slot redfish on gold spoons and spinner baits. Capt. Kevin worked the current lines and shallow pocket in the North Barataria Bay area and keep a look out for wakes and fins as with the warmer weather the redfish were in the shallows. Hi team used our regular speed retrieve as the warmer weather had the reds actively feeding. Just remember as it gets cold slow it down, some times just put it on their nose and work is slowly. The Crazy hot and cold weather has made catching fish a little more challenging than normal. Capt. T- Wayne found a large school of trout moving to a deeper area but still migrating on to a grassy flat to feed. The 3rd day after a cold front they were on and an easy limit was put into the box. Again anything chartreuse was the ticket. Capt. T-Wayne found a cork with 24â of leader would allow the jig to be worked slower and produces more keepers. The big Skeeter headed back to the Cajun Vista Inn and the crew was tickled with another awesome fishing trip from Bourgeois Fishing Charters! Taking a Little time to Enjoy South Louisiana's awesome Redfish!! Capt. Theophile took advantage of the awesome redfish bite and took his Mom of 82 years young, and Ginger fishing. Sporting the new fall colored Bourgeois Fishing shirts Capt. Theophile had no problem filling the K2 and turning the big Skeeter back towards The Cajun Vista Inn!! Well it looks like the redfish have traveled north from the spawning areas in the gulf, to feed in the upper estuaries of the North Barataria Basin!! The Team here at Bourgeois Fishing Charters have located several schools of slot reds with every 3rd-4th fish being a huge bull! Capt. T-Wayne and Capt. Kevin had several boxes of reds last week with two of their clients catching their first redfish ever! Most are caught while tight-lining plastics Bomber mud minnow anything chartreuse. The schools are blowing up on schools of pogies and are caught early in the morning by casting towards the schools. Capt. Theophile had a nice box the other day using top water lures, of course the bone colored Ba-Donk-A-Donk!! The Team here at Bourgeois Fishing Charters have been catching a nice mixed box of trout and redfish. Capt. Kevin and Cricket had a crew last week and caught 25-30 trout at the first secret hole, and a dozen or so on the next. Both Captains found a nice stringer of redfish to fill up the box and turn the big 240 Skeeter to The Cajun Vista Inn! Most of the trout were caught on the bomber mud minnow and the YUM silver mullet. The redfish were caught on gold spoons and Bombers Drum-Beater spinner bait. The Islands are still HOT!! The Island Adventure has been our most unique adventure for several years, and this year itâs been awesome, and still going strong. Plenty big trout caught on artificial baits, and plenty top-water action. The big redfish are always around the Islands. Capt. Theophile recently took a group to the islands and even though it is later in the year the fish were biting!! Fall Redfish Bite is ON! The Team here at Bourgeois Fishing Charters have been on a intense redfish bit for the past few weeks. Plenty action in the North Barataria bays working shore lines and pods of bait in the current lines. Capt. Darrin, Kevin, and T-Wayne put their group on redfish and had plenty slot reds to go in the box. Most reds were caught on gold spoons and the DrumBeater spinner baits with a black and chartreuse trailer. The Team here at Bourgeois Fishing Charters hosted a couples tournament form California. The South California Tune Club held their yearly event at The Cajun Vista Inn! Plenty trout and redfish were caught, Capt. Daniel had plenty happy anglers as the gals put plenty fish in the box. Trout were caught tight lining plastics and the redfish were caught on the Bomber Drum-Beater spinner bait. Our West-Coast friends said they will be back as the redfish were such a challenge to catch and they donât give up! Trout, Reds, and a FLOOR MAT! Flounder! Everyone had smiles as the vessel headed back to The Cajun Vista Inn. You are welcomed to come fish with Bourgeois Fishing Charters, we have a lodge that can sleep up to 52 people. We offer five-course dinners with fresh Louisiana seafood cooked with traditional cajun recipes, hot breakfast and a hot lunch when you return. We have 9 boats and 2 seaplanes available, more for large groups with a little time to plan, we have fishe d100 25 boats-4 per boat in one day!! Plenty great species from redfish, speckled trout, black drum, flounder, sheepshead, bass, and catfish. Maise dat's a bunch of trouts thereya cher! A comment titled: Re: WHEN LUCK IS ON YOUR SIDE!! in response to a report titled: WHEN LUCK IS ON YOUR SIDE!! Yes we have a lot of fun when our clients have these unique experiences. From their first redfish ever or a trophy trout the Team here at Bourgeois Fishing Charters enjoy and share our clients enthusiasm and joy!! This is all part of many of our clients first taste of a slice of Cajunality! Not sure if that's a word but you heard it here first. I have a new 2017 24 Morada with 350 loaded, I have a new sponsor so this one needs to go .5 hours factory tested only!! 504-2759679. Nice one, two punch, Catching a variety of quality fish in one is just such a great benefit of fishing South Louisiana!! A comment titled: Re: STUD Tripletail!!! in response to a report titled: STUD Tripletail!!! Bourgeois Fishing Charters can get you on the water, give us a call 504-275-9679 we have several boats available. We also have accommodations on the bayou!! There's plenty trout on those islands, the, on the line, to, in the net, ratio is pretty low like 50%. plenty top water action with the big ones throwing the lure the closer you get with one hand on the pole and another on the net. I have ducked many times to prevent a BA-Donk-A-Donk in the face. We don't always catch limits, mother nature has a way of turning them on and off as she wishes. We carefully follow all Louisiana State laws and conserve as many fish as possible. Great trip, Nice box of Fish Capt.! Bourgeois Charters has two lodge's down in Lafitte just 19 miles from The French Quarter! One lodge sleeps 52 people and the other sleeps 18. We have been in business since 1995. We host all sized groups and can fish up to 100 people! We have a full time Cajun Chef and lots of local Captains that know the water like the back of there hands!